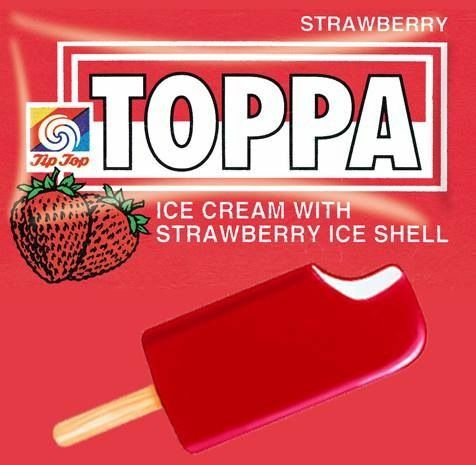 keewee01:The strawberry TOPPA! I remember those. Loved em! Made by TipTop. That might explain it. I used to like L&P but when I came back from living in the UK for 20+ years I found I hated it. Still made by the fish and chip shop at Opononi. Good old fashioned take-aways where there was was real meat in the burger and the chips were cooked in proper fat (tallow?). If you spread it out over a plate you would have meat, salad and potato - sounds pretty healthy to me. Now it's all plastic food. Dirty Dog cactus lemondade (energy drink). Great for staying awake while driving. Anything from Colgate, Unilever, Proctor & Gamble and Johnson & Johnson that used to be made here but is now made in Thailand, India or Brasil (or wherever troops can quell uprisings by angry exploited workers). This includes pretty much anything in the bathroom, laundry or kitchen. I'm not sure I actually miss any of these - but they're certainly nostalgic names from my misspent youth. Eww - sounds nasty - how was it 'spread' - by intimate contact? Maybe good we can't seem to get it any longer. I think (but not sure) you can still get Lion Brown and Rheineck? My first 'Buy a dozen, get drunk and throw up' at 15 yrs old was Rheineck. No issues at all buying it (in Newmarket I think) after school. When I was at Ohakea Airbase in the 70's we used to go to Service Station at Sanson (5 mins away) after the base bar's closed on a weekend and all quite drunk, we would have THE BEST BURGERS EVER. All REAL and FRESH produce including the meat and bun. Soaked all that booze right up. No Mac's or KFC or what ever international fast food back then. Today it is all far too processed and tasteless. Bluemoon ice-cream from the Hawks Bay way..
Allens Alien Lollies (pretty sure it was Allens). Man they were delicious!